The diagram below reveals the names of the eons and eras as defined by the scientific community. They indicate a slice of time in the history of Earth when special and relatively significant events occurred. This image is from the 2010 Edition of Encyclopedia Britannica. Expanded timeline PDF from The Geological Society of America. For example, the Archaean Eon represents a large chunk of time when no trace of life ever existed on Earth. The Proterozoic Eon represents the time when simple life forms appeared on Earth. And the one called the Phanerozoic Eon is used to mark the appearance of more advanced forms of life, including dinosaurs and mammals. 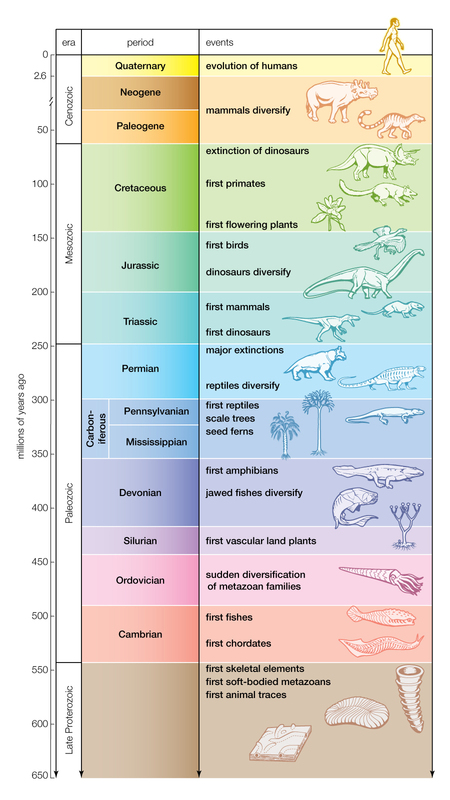 Similarly, the Paleozoic Era means "ancient life"; the Mesozoic Era is often called "The Age of the Reptiles" or "middle life"; and the Cenozoic Era is often called "The Age of the Mammals" or "recent life". And if we are not too careful, we may have to call the next Era in the history of the Earth "The Age of the Insects" given our continual warfaring tendencies and a focus on greed as if we don't have the brain capacity, the technology and/or the knowledge by now to help everyone with what they need to survive and achieve great things. Perhaps scientists might want to call the next era the "Obscene Epoch" instead of the Holocene Epoch should things continue the way they are today.